As country legends walk in and out of the Grand Ole Opry, today’s country stars follow in their footsteps. Inspiration flows from their country music heroes as they keep their spirits alive by performing their songs live. One country star who brought Hank Willams back to the Opry floor is Josh Turner. The talented singer recorded Williams’ “I Saw The Light” for his latest gospel album I Serve A Savior. Not only does this gospel melody have an incredible message behind it, but a story too. “I Saw The Light” was only the second song that Williams had ever recorded. Only two years before its release, Williams had been rejected by the Grand Ole Opry after his audition. Williams found inspiration from a remark his mother had made while they were traveling to Montgomery, Alabama. Since its debut, several country stars have covered their own version of the song. One of those stars is country and gospel singer, Josh Turner. Although Turner is known for his witty and flirtatious love songs, he has a strong background with his faith as well. The deep-voiced singer felt Gods was calling him to write a gospel album, so he did just that with I Serve A Savior. The gospel album is home to 12 gospel songs including both originals and classic hymns. One of the songs on the album was Williams’ “I Saw The Light.” Turner admitted that he has always been inspired by Hank Williams and had hoped to make his own version of this tune. While he tried recording it, he felt something was missing. In an exclusive with the singer himself, he explained where he found the inspiration for his rendition. “This one particular night I’m laying in bed and couldn’t quit thinking about it. So all of the sudden the inspiration hits me and I figured out what it was lacking. The guy in the song, he eventually, sees the light. But you can’t recongize light until you’ve been through the darkness. Featured alongside Turner on the cover is country and gospel singer, Sonya Isaacs. During their Opry performance, Turner started the song with guitar in hand and his band behind him. After the first verse, Isaacs began to harmonize with the singer during the chorus. Turner carries his deep and twangy vocals throughout the entire gospel tune. The two come together for the bridge of the song in praise and harmony. 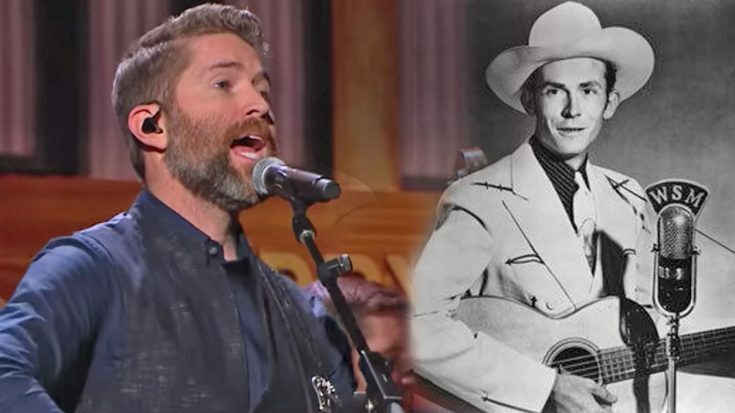 This is a must-see performance honoring The Lord and Hank Williams.